I have always loved the Ryerson hangout, Salad King on Yonge Street for a quick and delicious Thai meal. So , when they opened their sister restaurant Linda Modern Thai at the Shops at Don Mills, I was excited to try it. Long time Salad King diners will remember that a Linda restaurant used to be on the upper level of their old location on Gould Street. When Linda first arrived the Shops at Don Mills, I ate there and was completely underwhelmed. This Winterlicious was a great opportunity to give it a second go ‘round. So, some friends and I stopped in for a quick lunch. Linda Modern Thai is striking from outside , with an appealing modern design. It is obvious upon entering,that is certainly more upscale than Salad King. 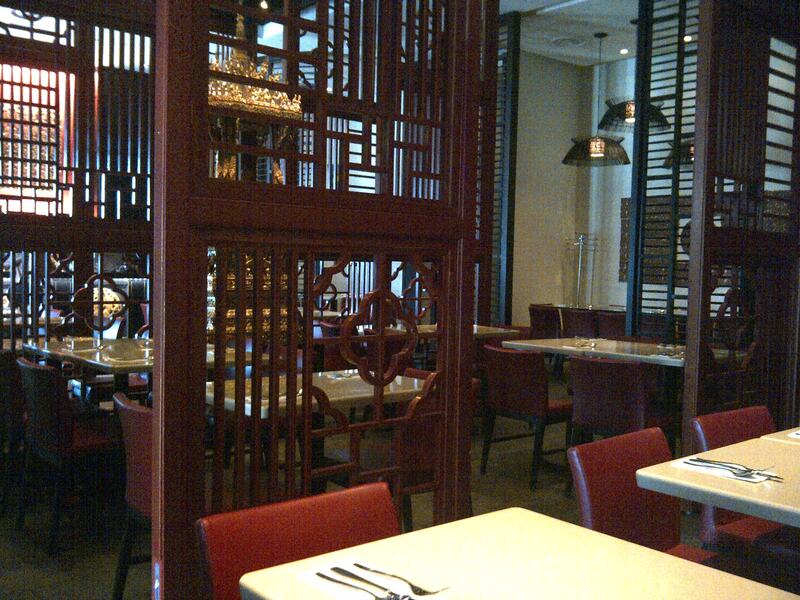 It is beautifully designed with tall Asian inspired screens throughout the restaurant. It is quiet and dim, perfect for a zen meal. We did not even notice that the restaurant had filled up around us, until it was time to leave. The dining area and restrooms are impeccably spotless. Our server was not overly friendly, but efficient and pleasant enough. I arrived before my party and ordered a green tea. Before he had brought it, I started to peruse the drink menu and discovered that there was more than one kind of green tea. I would have appreciated if he had pointed this out to me. Other than that , we really had no service issues. Dishes arrived in a timely fashion and we never felt rushed ( as can often be the case during Summerlicious and Winterlicious) The server brought my bill over and processed the payment quickly when we told him that I had to take off for work. For those who may not be familiar, Summerlicious and Winterlicious are an opportunity to order from limited time pix fixe menus at restaurants across Toronto. It is a fantastic value , and an opportunity to sample some of the cities culinary treasures. This year, Winterlicious runs from January 25- February 7. The Linda Winterlicious menu can be found here. The lunch is $15 and includes three courses. 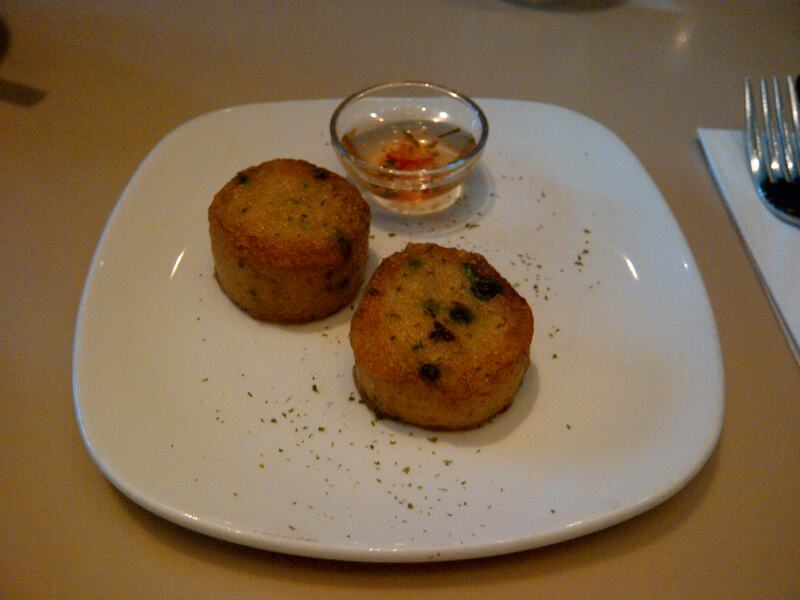 For my first course, I chose the Thai Fish Cakes. These were described as traditional Thai fish cakes made with white fish, lime leaf, and red curry. The two cakes were about the size of a large scallop each. They actually tasted a lot like scallops too. I am not certain how the fish played in to that dish but it was definitely more reminiscent of a cooked fish paste. It was tasty but I did not detect any of the yummy lime leaf and red curry that appeared in the description. My second course was Emerald Curry. This appeared on the menu as traditional Thai vegetables in a homemade green curry. 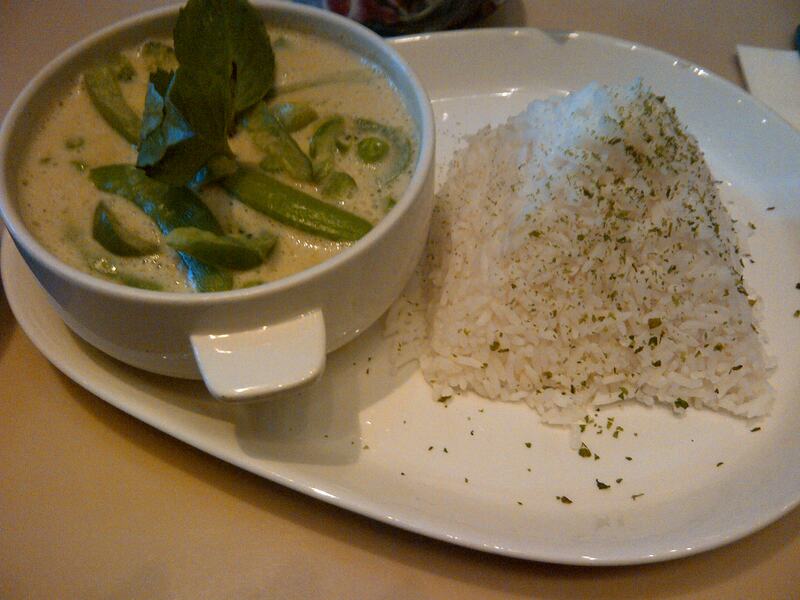 I was looking forward to this , as green curry is usually my dish of choice at Salad King. In my opinion, Salad King’s version is much, much better. First of all, this only contained green veggies. Peas, broccoli and green pepper were cut up and served in the sauce with a side of steamed rice. I think more vegetables ( eggplant, carrots…anything NOT green) would have added greatly to the dish. I suppose that’s what I get for going emerald, but I thought that was just referring to the sauce. The curry broth itself, was tasty and thick with rich coconut milk, but seemed to lack something in the way of spices. My friend chose a different main course, Tamarind Peppercorn Chicken. This was described as chicken and eggplant in a tamarind, coconut and peppercorn sauce. 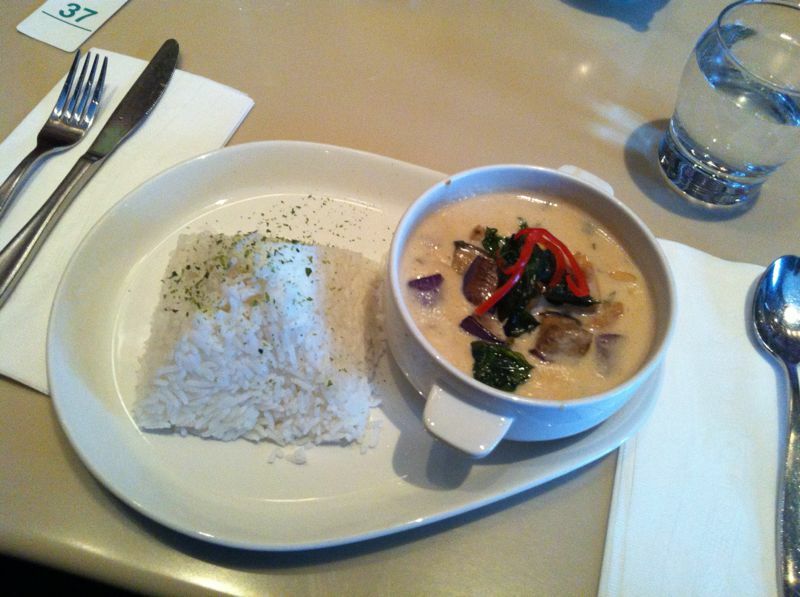 She decribed the dish as a tasty red curry. However, it was full of whole peppercorns that were difficult to eat around. She even wondered if perhaps her serving came from the bottom of the pot where all of the peppercorns were. This dish featured a nice array of vegetables like eggplant and broccoli, I wish they’d have used some of that eggplant in the Emerald Curry as well. My final selection was coconut ice cream. This was delicious. 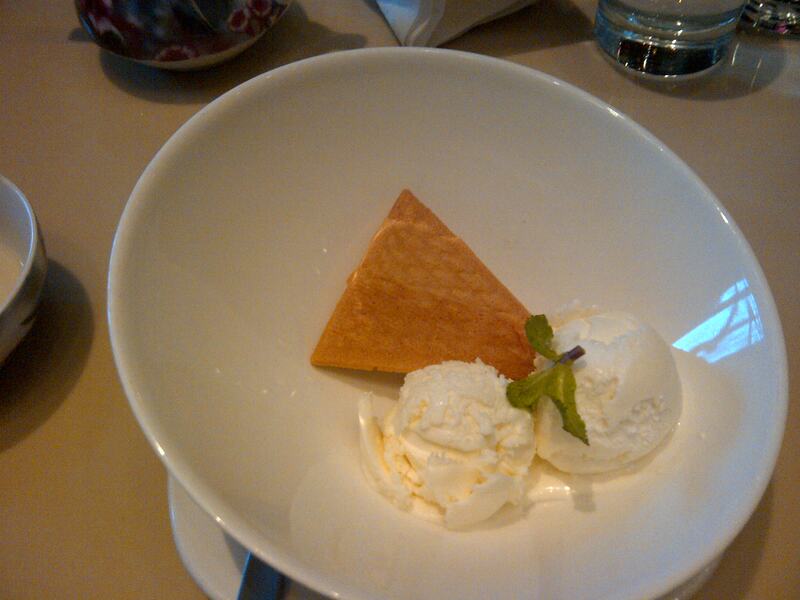 The dessert was served with a wafer, and was refreshing and cool on my palate after lunch. $15 is a fantastic price for three courses at any restaurant. The lunch potions were sufficient and while we did not leave stuffed, we were definitely not hungry. I would be interested to know if the Emerald Curry always comes with a few green veggies, of if this was Linda’s way of being cost-effective for Winterlicious. Still, it is definitely worth a try. If you have ever been curious about Linda Modern Thai, this is definitely the time to give it a try with minimal wallet impact! Ultimately, I was underwhelmed with Linda yet again. While the experience was pleasant enough, I think I would sooner make the trek downtown to Salad King where I can be sure of an exceptionally tasty Thai meal. I was very happy for a review of Linda’s because like you, Salad King is a long-time favourite of mine. Even though Salad King can be a bit loud and frenzied, the food is incomparable. Have you been to Salad King since it changed locations. I like the seating much better now. It can still get loud, but there are nicer, more private booths available now. No, I haven’t but I will definitely check it out! By the way, I used to have a manager who could eat a dish with 10 chilis on the Salad King chili scale! I could only ever manage 1 or 2 at the most! Thanks for the info!